When the South Side Rapid Transit was awarded their franchise for an extension to Jackson Park in the early 1890s, two branches were also approved. One was to leave the line between 55th and 59th Street and head in a generally easterly direction, terminating south of 63rd Street between Wentworth and Wallace. With the South Side Elevated's successful outlook in the early 1900s, they decided to exercise this clause and construct their first branch. The Englewood Elevated Railroad Company was incorporated in early 1903 to construct the branch and on March 16th, they were granted a franchise to build a main line (the Englewood branch) and a short branch (the Normal Park branch). The ordinance outlined a route basically the same as the original clause in the 1890s franchise, but extended the main line from a between Wallace and Wentworth westward between 60th and 67th streets to a terminal between Center (Racine) and Ashland avenues. The Normal Park branch was to leave the main line near Wentworth and continue south to between 68th and 72nd streets. The company lost no time in exercising its franchise and construction began immediately. By 1905 the first half mile of the branch was completed and a shuttle was instituted between the first station at State Street and 58th Street on the main line, where passengers changed for Loop or Jackson Park trains. Segments of the branch opened as they were completed and service on the shuttle was extended west to Wentworth station on December 10, 1895 and to Princeton station on January 11, 1906. At this point, a 226-day steel workers' strike crippled work on the line and little progress was made. The next extension did not open until November 3rd, when service reached Harvard Avenue at 63rd Street. At this point, express trains through to the Loop were adding during rush hours, although the 58th Street shuttles still prevailed in the off-peak. Workers continued to complete the branch and just a few months later service was extended to Halsted Street, the location of an important South Side shopping district, for some Christmas Eve shoppers on December 24th, bringing with it the activation of Parnell station as well. Center (later Racine) opened on February 4, 1907, followed by the terminal at Loomis on July 13th. The Loomis terminal included an elevated car storage yard and small maintenance shop. The shuttle trains continued to operate from Loomis to 58th Street in the off-peak until 1911, after which all trains continued to the Loop. The short Normal Park branch, less than a mile long, opened on May 25, 1907 and departed from the Englewood branch west of Harvard station. March 16, 1903 - City grants a 35-year franchise to the Englewood Elevated Railroad Company (who was controlled by the South Side Elevated) to build a main line that would leave the South Side between 55th and 60th Streets, turn west to between Wentworth and Wallace Avenues, turn south to a point between 61st and 67th Avenues, then turn south and terminate between Racine and Ashland Avenues [the Englewood branch]; as well as a branch line leaving the above and paralleling Wentworth Avenue to a point between 68th and 72nd Streets [the Normal Park branch]. November 3, 1905 - The first phase of the Englewood branch opens as far as State Street. A shuttle car in placed in operation that connects to the main line at 58th Street, where passengers can transfer to Loop-Jackson Park trains. December 10, 1905 - Englewood branch service is extended to Wentworth Avenue. November 3, 1906 - The next section of the Englewood branch, a two block stretch to Harvard Avenue at 63rd Street, finally opens, having been the victim of a 228-day steel workers' strike. At this time, express service to the Loop is instituted during rush hours. The shuttle to 58th Street remains in operation at all other times. December 24, 1906 - The Englewood branch is extended to Halsted Street, also activating the Parnell Street station. February 25, 1907 - Englewood service is extended west to Center [Racine] Avenue. July 13, 1907 - The Englewood branch completed to its terminal at Loomis Boulevard. The terminal also includes a coach yard and light maintenance facility. July 31, 1949 - The CTA institutes its massive North-South service revision. Howard-Englewood route is created. A/B skip stop service is instituted on the Howard, Englewood, Jackson Park and Ravenswood routes. Low-use stations are closed, including Pershing, Princeton and Parnell. September 2, 1973 - State is closed in a service revision to close a budget gap. February 9, 1992 - Harvard and Wentworth are closed in a service revision to close a budget gap. 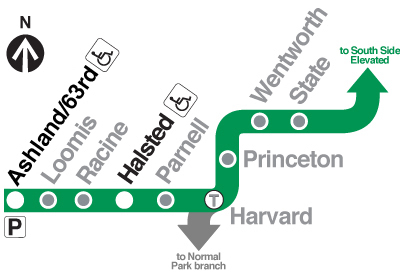 May 12, 1996 - The Green Line reopens after a renovation project lasting more than 2 years. Owl service is retained, but Racine/63 is closed. Englewood branch is officially renamed the Ashland branch. April 27, 1998 - The CTA institutes some of the largest service cuts in its history. Under the Booz-Allen Hamilton Service Plan. Owl Service is cut on the Green Line.